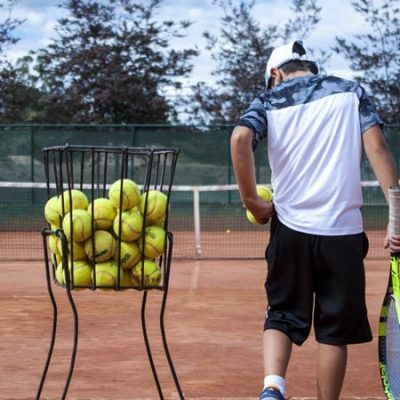 Home » Theory » Can You Use The Serve And Volley Game To Win On Clay? If you’re a fan of professional tennis, you probably know that no serve and volley player has won the French Open (played on red clay) since Yannick Noah did it in 1983. However, a vast gulf exists in the level of professional tennis and the club level of tennis. That begs the question: can you use the serve and volley game to win on clay at the club level? The answer is resoundingly, yes! A good serve and volley game is difficult to beat on any surface – and because it is rarely used, club players typically do not respond well to the pressure of it. 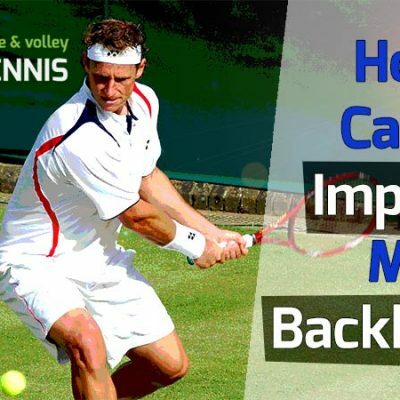 In this post, we’ll explore the serve and volley game on clay and how it can be used to win more of your matches. 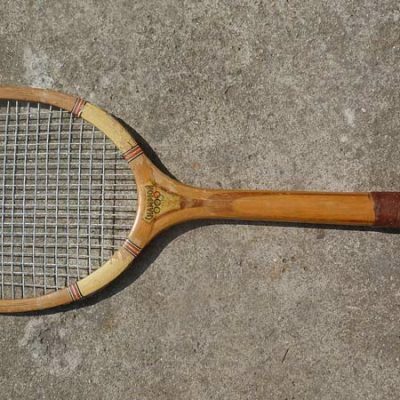 First, it should be noted that other great serve and volley players like Patrick Rafter, John McEnroe and Boris Becker all used the serve and volley game to go deep (semifinals and finals) into the French Open tournament during their careers. If the serve and volley game was not suitable for clay, those great players would have lost in the first or second round every year, but they didn’t. While the serve and volley game is not ideally suited for clay at the professional level, it still enjoyed a level of success on clay. You can take that to heart if you choose to learn and employ the serve and volley game. 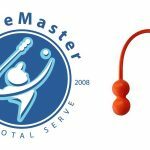 What Is The Ideal Surface For Serve And Volley? At the professional level, grass is the ideal surface for serve and volley. In descending order, the next best surface is hard court, then Har-Tru (green clay) and finally red clay (the slowest surface). Most club level play is done on Har-Tru, but some matches are played on red clay, which is rarer. 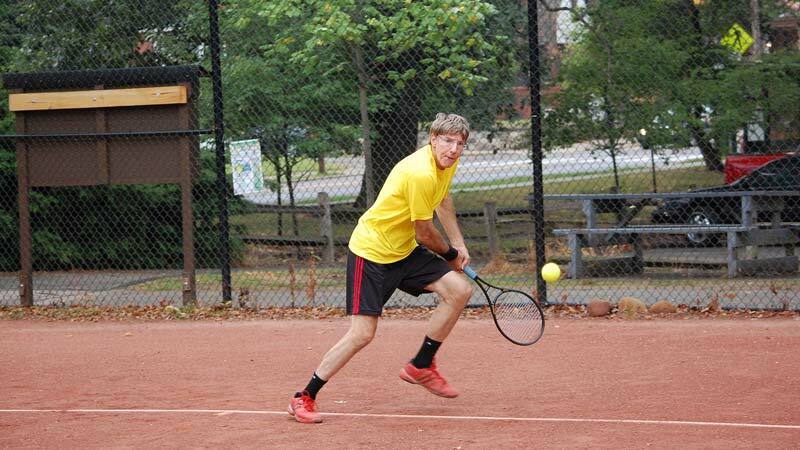 The serve and volley game will work for both Har-Tru and red clay at the club level, but the slower the surface, the harder it is to win with. 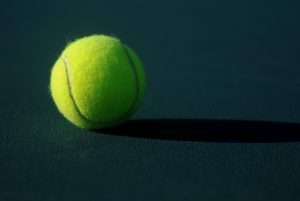 Traditionally, the consensus of tennis experts and players is that slow surfaces (like red clay) allow the tennis ball to bounce higher and slower, giving the baseliner more time to set up for returns and groundstrokes. This second or two of extra time is all that’s needed for the advantage to swing in the direction of the baseline player – especially at the pro level. 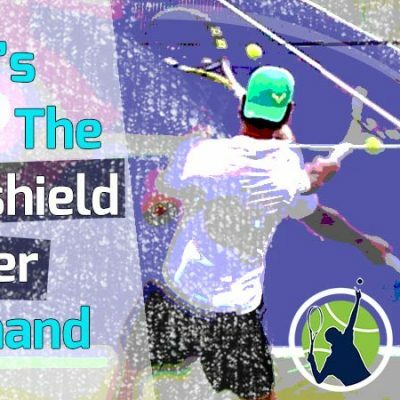 While the pro game continues to move away from the serve and volley game, the club level player can still benefit tremendously from this lost art. Below are five reasons why we believe S&V will work on any clay surface. Much of the thought behind these reasons come from our years of experience playing the club level circuit and watching countless club matches. Serve and volley is rarely seen in club level play. Thus most baseline players have no idea how to defend against it effectively. The constant pressure of the serve and volley game mentally breaks a baseline player and forces him or her into a stream of unforced errors. Irregular bounces on clay can be difficult to time – especially on the serve. 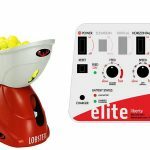 This allows the serve and volley player easier shots to volley back. Traction on clay is worse than hard courts. This can negatively affect the baseliner’s ability to move to the first volley and subsequent shots. 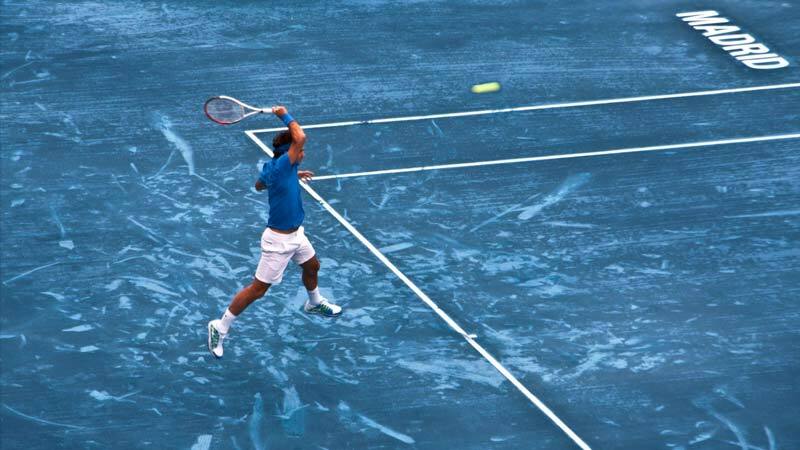 The clay has frequent “dead zones” near the net, where drop shots don’t bounce well and can be impossible to run down. I’ve been playing club level tennis for 25 years, and I’ve come across only a handful of true serve and volley singles players in that time. Although I easily faced off against over 100 different opponents in that time, perhaps only 6 or 7 of them serve and volleyed – and I could name every player. Baseliners are a dime a dozen, but great serve and volley players are truly rare gems. Since the serve and volley game is rarely employed, it is a difficult style to beat. Most baseline players can’t adjust to the pressure of a good volleyer during the match, no matter what surface the game is played on. At the club level, most players cannot hit with enough precision and power to affect the volley player. At the higher levels of tennis, the player volleying is very much affected, which is why S&V is no longer seen on clay. At the club level, the S&V player usually has enough time to hit a good first volley, which is key to ending the point not long after. Besides, most baseliners have no clue how to effectively play against the serve and volley game due to their lack of experience facing it. In contrast, the serve and volley player has a ton of experience facing the baseline game, because that’s usually the only alternative style. Anyone can mentally handle an occasional serve and volley point. But when you know the server will be rushing the net behind a good first or second serve every single point, the pressure is turned up 10-fold. 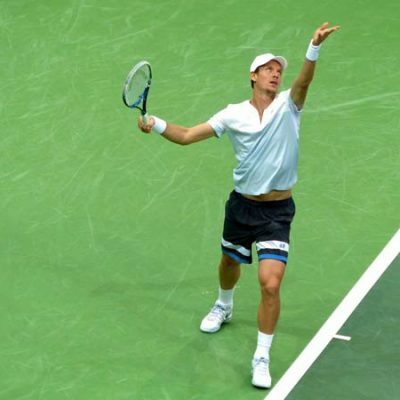 Typically, the baseliner feels comfortable playing against the same style because they can float their return and hit almost anywhere on the court to start the rally. But try that against a good volley player and it’s good night Irene. The constant pressure to hit great passing shots soon wears on the baseline returner, causing an influx of unforced errors. As the errors pile up, the baseliner’s confidence comes crashing down, making things even worse. Many times the baseliner will overhit the ball thinking it’s their only hope. 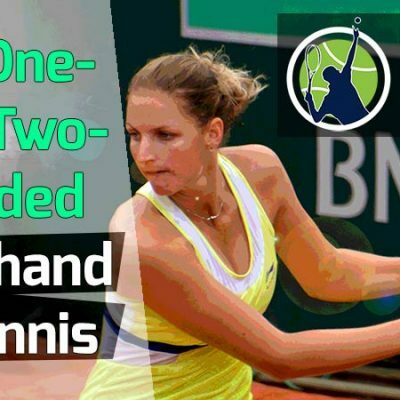 But he or she only misses more, making the game easier for the serve and volley player. Once a player mentally breaks in tennis, there is a very high chance they’ll lose the match. I’ve even seen players tank and give up during the match when mentally broken. 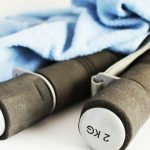 Incidentally, if you want to know how to beat the serve and volley game, see our blog post here for details. 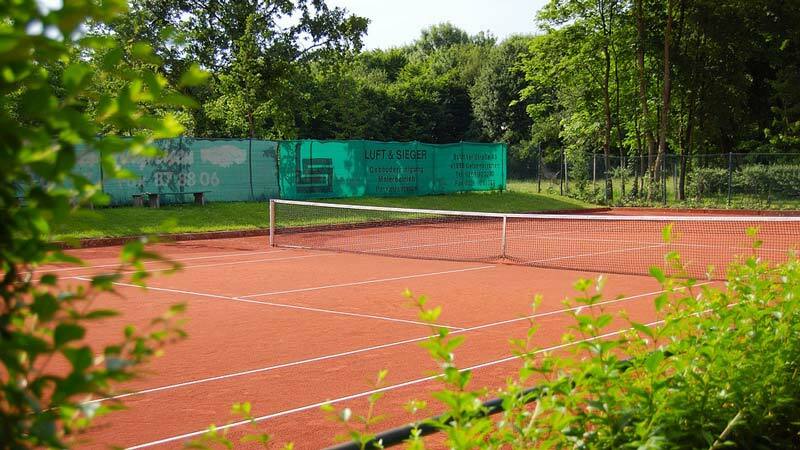 Unlike hard courts, red clay and Har-Tru are uneven surfaces, causing funky bounces that take players by surprise. This is especially true as the match progresses. Players step here and there, slide in the clay and cause unevenness all over the court. When the ball lands in these places, it can be tricky to hit. This favors the serve and volley player, as their first hit of the ball is usually a volley taken out of the air with no bounce on the clay. If the volleyer makes the first volley, the next shot can be tricky to hit for the returner. He or she will probably be rushed by the volley on the uneven clay. An honorable mention here is the wind. Most baseline players do not like the wind. However the serve and volley player, while also affected by the wind, is not affected as much. This is because they often do not have to contend with weird bounces due to cutting off the ball in mid-air. If you’ve ever played on clay you know how slippery it can be. This is especially true if the courts get a little wet. Most Har-Tru courts are watered from above ground with a sprinkler system to keep them slightly moist. However, some Har-Tru courts are watered from underneath the ground. These are called “hydro courts” and are, in my opinion, much more slippery than non-hydro courts. I usually do not like playing on hydro courts because of how little traction I have. It takes away my speed, which is one of my greatest assets on the court. It’s brutal playing a good serve and volley player on hydro courts. I always feel like I’m ice skating out there. Making sudden stops, starts and turns are challenging on hydro courts and sometimes feel impossible. On regular clay courts, traction is better, but not nearly as good as hard courts. For this reason, I feel that the serve and volley game can translate well on the clay. It’s the baseline player who is usually scampering around the court to retrieve the volley, fumbling in the clay, while the S&V player controls the net. 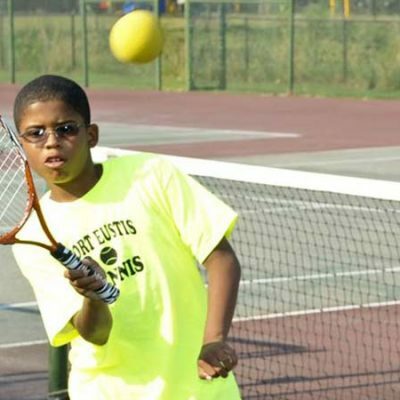 It’s a wide-spread belief the ball bounces higher on clay than hard court, and it’s true – well mostly. The ball will bounce higher on clay over most of the court, but many clay courts I’ve played on have “dead spots” within 7-8 feet of the net. If you hit a well-executed drop volley that lands close to the net, the ball has the potential to bounce very low, as the clay is often very soft in that area, similar to a pile of sand. I’ve experienced this situation many times on clay, mostly on Har-Tru. Throw in the factor of less traction on clay and the drop volley (or drop shot for that matter) can be a very effective way to win the point. I consider myself very quick on the tennis court, but I’ve been burned many times by excellent drop shots and volleys close to the net that never seem to bounce. On hard court, it just feels easier to get a racquet on them. Again, playing on clay favors the serve and volley player using the drop volley to great effect. 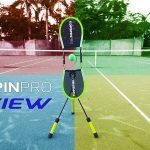 If you’re a beginner, or even an intermediate player, and want to try the serve and volley, definitely give it a shot. Don’t be discouraged by other players and coaches telling you it won’t work on clay. I am an advanced club level player and I’ve seen good serve and volley players take apart and frustrate good baseline players to no end. Most club players have no idea how to handle a good serve and volley game because they rarely ever face it, unless in doubles, and on occasion. This gives the serve and volley player an immediate advantage, whether on clay or another surface. 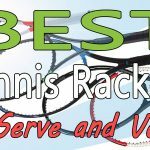 We have many great blog posts and youtube videos on how to serve and volley. If you want to turn up the pressure on your opponent and take your game to the next level, determine to use the serve and volley game until it becomes habit. Ending points easily and decisively is always fun. 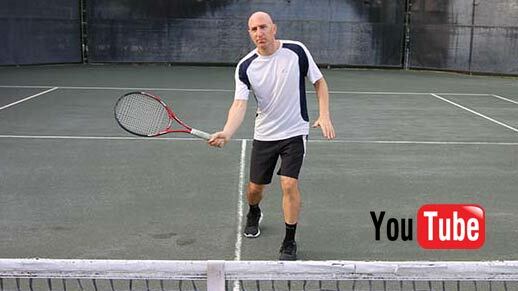 So get out there and start practicing that serve and work on those volleys. You won’t regret it!